The word whisky (or whiskey) is an Anglicization of the Gaelic word uisce|uisge meaning water. Distilled alcohol was known in Latin as aqua vitae, "water of life". This was translated to Gaelic as Irish: uisce beatha and Scottish Gaelic: uisge beatha, "lively water" or "water of life". Early forms of the word in English included uskebeaghe (1581), usquebaugh (1610), usquebath (1621), usquebae (1715). It is possible that distillation was practiced by the Babylonians in Mesopotamia in the 2nd millennium BC, with perfumes and aromatics being distilled but this is subject to uncertain and disputable interpretation of evidence. The earliest certain chemical distillations were by Greeks in Alexandria in about the 3rd century (AD), but these were not distillations of alcohol. The medieval Arabs adopted the distillation technique of the Alexandrian Greeks, and written records in Arabic begin in the 9th century, but again these were not distillations of alcohol. 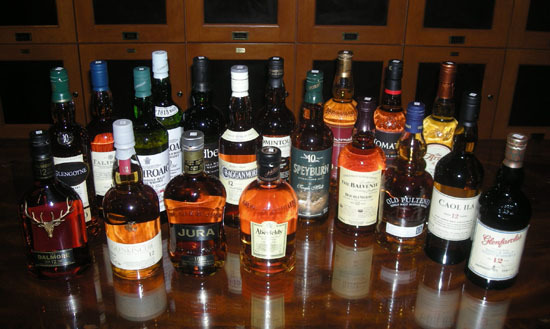 Scotch whisky (often referred to simply as "Scotch") is malt whisky or grain whisky made in Scotland. All Scotch whisky was originally made from malt barley. Commercial distilleries began introducing whisky made from wheat and rye in the late eighteenth century. Whisky was as intrinsic a part of Gaelic life as bread and had a surprising range of invaluable applications. It kept out the cold, set up the traveller for his journey and soothed him when it was over, punctuated social meetings and sealed business discussions. The scope beyond its being a mere accompaniment to other things was extraordinary. Whisky tempered fever, acted as an anesthetic, especially in childbirth, and disinfected sword-cuts. It was even used with oatcakes to serve Communion for want of wine and bread at the Battle of Culloden. The first written reference to whisky in Scotland is from 1494 when a listing of ‘eight bolls of malt to Friar John Cor wherewith to make aqua vitae appears in the Scottish Exchequer Rolls. However whisky had probably already been made for centuries by this time, documentary evidence for it having gone up in smoke in the frequent wars and feuds that typified the era. By the time of good Friar John, whisky was already a developed product, drunk by kings and nobles and, clearly, made in monasteries by monks who were most likely the expert distillers of the day. Scotch whisky is divided into five distinct categories: single malt Scotch whisky, single grain Scotch whisky, blended malt Scotch whisky (formerly called "vatted malt" or "pure malt"), blended grain Scotch whisky, and blended Scotch whisky. All Scotch whisky must be aged in oak barrels for at least three years. Any age statement on a bottle of Scotch whisky, expressed in numerical form, must reflect the age of the youngest whisky used to produce that product. A whisky with an age statement is known as guaranteed-age whisky. Lowland — only three distilleries remain in operation: Auchentoshan, Bladnoch, and Glenkinchie. Speyside — has the largest number of distilleries, which includes: Aberlour, Balvenie, Cardhu, Cragganmore, Glenfarclas, Glenfiddich, Speyburn, The Glenlivet, The Glenrothes and The Macallan. Highland — some Highland distilleries: Aberfeldy, Balblair, Ben Nevis, Dalmore, Dalwhinnie, Glen Ord, Glenmorangie, Oban and Old Pulteney. The Islands, an unrecognized sub-region includes all of the whisky-producing islands (but excludes Islay): Arran, Jura, Mull, Orkney and Skye — with their respective distilleries: Arran, Isle of Jura, Tobermory, Highland Park and Scapa, and Talisker. Islay— has eight producing distilleries: Ardbeg, Bowmore, Bruichladdich, Bunnahabhain, Caol Ila, Kilchoman, Lagavulin and Laphroaig.